Have you heard of mink fur eyelash extensions and eyebrows? They've been around a few years now, used to provide realistic-looking longer eyelashes and brows. Here's the clincher: apparently they are "cruelty-free" and ethically harvested! One supplier told me that the fur comes from free-range mink harvested by gently brushing live animals. "Yeah right!" I hear you cry. Sounds quaint but the idea is frankly ridiculous. Absurd. Many companies (and members of the public) have been duped into believing these eyelashes are cruelty-free. 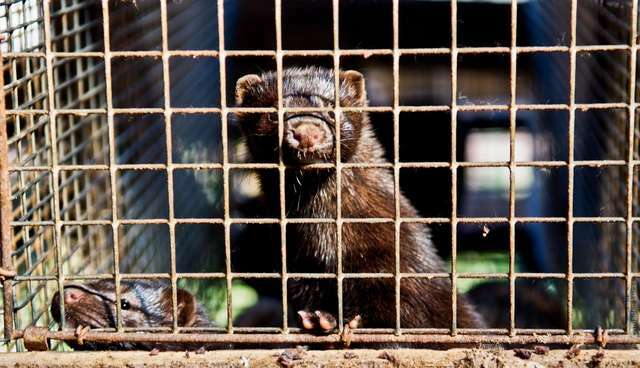 I have been campaigning against the fur trade for many years and there is no situation where mink fur could be "harvested" apart from on a fur farm. There is also no kind of mink farm where they are allowed to roam free. Mink would not be able to be kept free-range because they are aggressive, solitary animals and would fight each other within the restricted area. Life on a fur farm is nothing short of horrific. Along with being kept in tiny, wire bottomed cages, mink are not given access to water to bathe in despite being semi-aquatic animals. They are also not able to roam. Yet in the wild they would travel for miles every day. Because mink are not domesticated animals they are naturally afraid of humans, and being kept in dirty, wire cages is awful for them, going against all their natural instincts. There is nothing humane or ethical about depriving these animals of their behavioral and physiological needs. Fur-farming is nothing more than torture. What country is the mink farm in? What happens to the animals after they have been brushed? Do you have any photos of the farm? Their refusal, or inability, to answer speaks volumes. But what we do know is this: mink on fur farms are killed once they have a thick winter coat, so the fur comes from them either before they are killed or after, as a direct byproduct. Either way, mink eyelashes and eyebrows support a terrible industry and animal suffering in tiny cages. Help us spread the word about fur cruelty by sharing this blog and SAFE's fur page. If you know of a company selling mink fur eyelashes and eyebrows tell them you won't be buying anything from them again until they withdraw them from sale.